Clift, S., Page, S., Daykin, N., Peasgood, E. (2016) The perceived effects of singing on the health and well-being of wives and partners of members of the British Armed Forces: a cross-sectional survey. Public Health, 138, pp. 93-100. 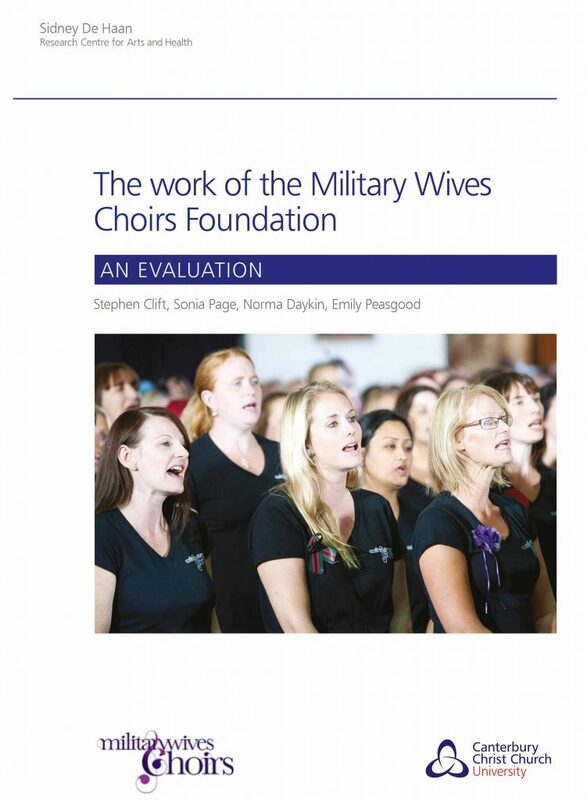 Clift, S., Page, S., Daykin, N., Peasgood, E. (2015) The Work of the Military Wives Choirs Foundation, Canterbury: Canterbury Christ Church University. Peasgood, E. (2016) ‘Composing Experimental Music for Adult Community Choirs’, Innovation and Change in Community Music: Proceedings of the XV International Seminar of the ISME Commission on Community Music Activity. Edinburgh College, Edinburgh, Scotland, 19-23 July. ISME International Society for Music Education, pp. 249-256. Research Assistant: Sidney De Haan Research Centre for Arts and Health: Evaluating the impact of the Military Wives Choirs Foundation, The Royal Society of Public Health’s Art and Health Awards and creating resources for arts and health practitioners.